Zinwave's ultra wideband, all-fiber platform provides the most efficient system architecture designed for improving in-building cellular, public safety and two-way communication. It is easy to deploy, has the lowest total cost of ownership, and it is the only platform available that utilizes the cabling infrastructure installed once for all services below 6GHz and mmWave. Zinwave has developed an initial 3.0GHz—6.0GHz variant of its innovative wide-band RF over Fiber DAS, and it is ready to support early field trials of new services in the 3.0GHz—6.0GHz CBRS Band 48 spectrum. Further bands within the 3.0GHz—6.0GHz range will be validated and supported by Zinwave. WiFi only provides basic connectivity with limited applications. Download our infographic to learn how a Zinwave DAS provides the optimal connectivity and complete interoperability with CBRS/OnGo, commercial cellular and public safety. It's important to know and understand the six key criteria for choosing the optimal DAS solution for in-building connectivity. Download the eBook to learn about each criteria and which questions should be asked when evaluating a DAS solution. In-Building Coverage For The World’s Top Brands. From Fortune 100 corporate headquarters to a worldwide array of leading hotels, hospitals, campuses, arenas and more, Zinwave has the enterprise covered. Learn more in our corporate brochure. zinwave featured on Innovations tv with ed begley, jr.
Zinwave was featured on Innovations TV with Ed Begley, Jr, appearing on CNBC and the History Channel. The segment covers the trends in in-building wireless technology and includes interviews with members of the Zinwave leadership team and industry analyst, Joe Madden, President of Mobile Experts. Viewers will learn about the growing dependence on mobile devices, the trend of mobility in the workplace, and the demand for reliable in-building wireless connectivity. With the launch of OnGo, the newly released private LTE spectrum, Zinwave announced pilots with several Fortune 100 customers. As a superior connectivity solution that offers better than Wi-Fi connection, it delivers the enterprise optimal reliability and security for business-critical applications. Businesses are investing in solutions to improve indoor cellular and public safety coverage so employees, tenants, guests and first responders can stay connected when they require it most.Therefore, identifying and solving any issues that affect optimal network performance is critical. Zinwave CEO, Scott Willis, and Zinwave CTO, Slavko Djukic, introduce the Zinwave Private LTE Solution for Enterprise customers. Slavko Djukic, CTO, discusses the importance of interoperability and why Private LTE is better than WiFi for business applications. Scott Willis, CEO, discusses the importance of Private LTE and how it will help to strategically align the Enterprise. Slavko Djukic, CTO at Zinwave demonstrates their patented wide band RF over fiber distributed antenna system platform for solving coverage issues in public venues, enterprise and more at Mobile World Congress 2018. Zinwave CEO, Scott Willis and CTO, Slavko Djukic discuss Zinwave's DAS technology with RCR Wireless Editor, Sean Kinney at Mobile World Congress. Hear how in-building cellular is moving with the rest of the wireless industry. First responders call in-building communications capabilities critical. More than half say they have experienced communication failure in the last 24 months.The need for reliable in-building connectivity will only grow in the coming years. The best solutions will ensure that building owners will have a flexible, cost-effective, and future-proof solutions that provides the connectivity necessary to support both first responders and building occupants. Zinwave’s UNItivity 5000 is the latest innovative, streamlined DAS platform developed to meet in-building cellular and public safety connectivity needs. that accommodates all public safety bands in a single optical remote unit. This remote specifically compliments a Zinwave DAS system. Zinwave has launched UNItivity 5000 and UNItivity NMS (Network Management System), reflecting the evolution of its patented DAS technology. Key improvements make it the most effective, highest quality solution available. Learn more about the next generation upgrades that position Zinwave for the future of in-building wireless service: 5G, LTE-U, LAA, and CBRS, ensuring that businesses can connect to the realities of today and the possibilities of tomorrow. The need for reliable in-building connectivity will only grow in the coming years. The best solutions will ensure that building owners will have a flexible, cost-effective, and future-proof solutions that provides the connectivity necessary to support both first responders and building occupants. Solving for indoor cellular connectivity is no longer an option, but you do have options for how you do it. Which solution is right depends on several factors, but to help narrow down your search, start with this quick guide. The healthcare industry has rapidly adopted mobile technologies, from electronic health records (EHRs) to advances in telehealth to BYOD policies. There are considerations you should take into account when ensuring that facilities are equipped to meet cellular demands. Download our eBook to understand how increases in cellular demand affect the quality of care, the solutions available and the total cost of ownership. Voice over WiFi, repeaters, small cells and DAS: Which is right for you? Before choosing an in-building wireless solution, it's important to have the information you need to ensure you select the technology that is the best fit for your business. Download our eBook now to learn the factors to consider, the benefits and limitations of each option, and finding the best solution for your needs. U.S. workers in every industry are using their cell phones in the workpace more than they ever have. They are talking with coworkers and, more importantly, customer, potential clients and partners. They are also noticing when they struggle with cellular coverage - and it's often. All distributed antenna systems will help you amplify the cellular signal inside your building, but how they do it is different. Download our solutions matrix to help make a decision on which solution is the best fit for you. DAS and small cells are often seen as two conflicting solutions to in-building wireless service, but increasingly, small cells are being used to provide the RF signal source for DAS installations. Learn about Zinwave’s 3F Advantage, Cellular-as-a-Service and the importance of in-building wireless solution for commercial real estate, healthcare, hospitality, airports, universities and public venues. Hear more about the importance of a reliable in-building mobile experience and how it affects employee, customer and general business productivity. DAS and small cells are often seen as two conflicting solutions to in-building wireless service, but increasingly, small cells are being used to provide the RF signal source for DAS installations. In this white paper, we’ll look at how small cells and DAS can work together in in-building wireless deployments, and how Zinwave enables this interaction. Email and cell phones are now more popular than the desk phone for internal and external communications. Download our infographic to learn more about how cellular connectivity is now a necessity in the workplace. In our increasingly mobile world, mobile communication tools have become the preference for most in the workforce. In a recent survey, Zinwave asked more than 1,000 U.S. workers how frequently they used specific methods of communication in the office, and the answers confirmed offered some surprising insights into the way that employees are communicating with those both in and out of the office. Download the survey to learn more. For decades, the desk phone was the key communication tool of the U.S. office worker. It was the only avenue most employees had for keeping in contact with clients and customers, touching base with co-workers inside the building and, on a more personal level, connecting with family members and friends. More businesses are discovering how critical it is to invest in an in-building wireless solution. Multiple elements must be evaluated in order to choose the optimal solution while also factoring in how to minimize cost and maximize return. Zinwave’s eBook is a guide to getting the most out of your cellular coverage investment. 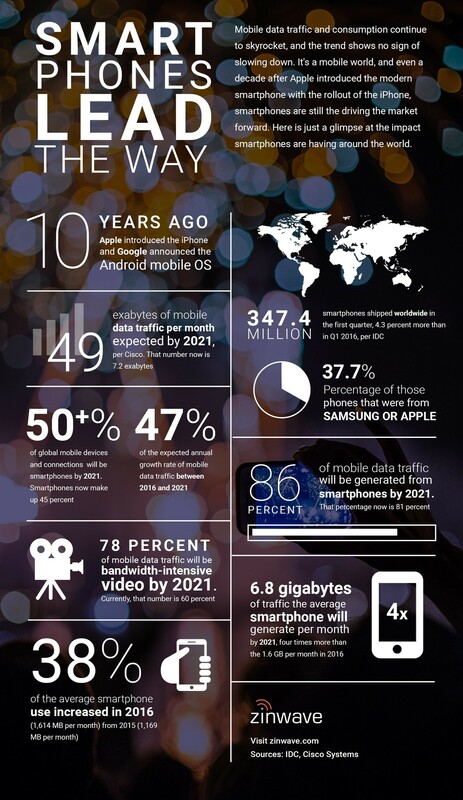 Mobile data traffic and consumption continue to skyrocket, and the trend shows no sign of slowing down. Healthcare providers continually want to improve the speed, accuracy, and efficiency of their services, and most have adapted wireless technology for medical telemtry, electronic records, and other applications. Our devices are more than just phones or computers, they are an extension of who we are. And when we aren’t able to use them how we want, it's a problem. 74% of U.S. office workers complain about poor In-building cellular coverage. Zinwave breaks through the barriers to in-building connectivity with a unique Wideband Active Distributed Antenna System (DAS) that solves historical issues associated with delivering multiple in-building wireless services. Zinwave CEO Scott Willis explains that companies realize the wireless carriers are unlikely to invest in distributed antenna systems on premise to help with corporate connectivity needs. Businesses need to make the investment themselves, and they want to choose equipment that will scale and adapt to new technologies like 5G. Many in the industry have looked at small cells and DAS as an either/or proposition when delivering mobile wireless coverage inside buildings, but small cells and DAS can work together to overcome drawbacks of either approach alone.. User demand for continuous, high-quality wireless voice and data performance throughout buildings has become a major issue for building owners. Tenants demand ubiquitous coverage everywhere, including elevators. Zinwave’s UNIconnect Active POI (Point Of Interface) is a compact, space saving device that simplifies connectivity to multiple base stations, repeaters or radio heads by removing the need for custom-built multi-component interfaces for each implementation. Zinwave's Small Cell Point of Interface (SC-POI), is a low cost, easy to install point of interface panel enabling quick and easy deployment and integration of up to 4 small cells per panel with Zinwave’s UNItivity solution. Does Your Building Have The Optimal Solution? Download the eBook, Six Criteria for Choosing the Optimal DAS Solution, to learn more about selecting the optimal in-building wireless solution.